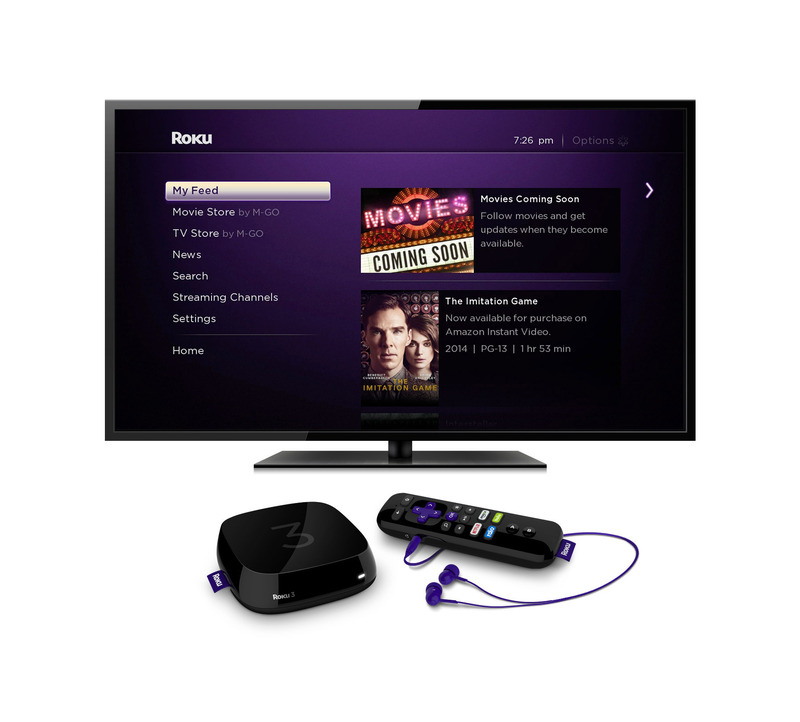 "With the biggest lineup of streaming channels available, the most comprehensive and unbiased search, and new ways to discover new movies; Roku players make it simple for consumers to stream the entertainment they want to watch on their terms"
SARATOGA, Calif.--(BUSINESS WIRE)--Roku Inc., which is widely applauded for giving consumers the most comprehensive and unbiased search, today released new ways for consumers to find and discover streaming entertainment. The ‘Roku Feed’ is a new feature that allows consumers to follow entertainment and get automatic updates on pricing and availability. Roku is launching the feature with a focus on ‘Movies Coming Soon’ taking the guessing out of when a box office hit is available for streaming, which services offer the movie or how much it costs. The company also introduced a new Roku 3 streaming player with voice search and a new faster-than-ever-before Roku 2 streaming player. The new features, new players and updated mobile apps are available beginning today. Roku is the creator of a popular streaming platform for delivering entertainment to the TV. Roku streaming players and the Roku Streaming Stick® are made by Roku and sold through major retailers in the U.S., Canada, the U.K. and the Republic of Ireland. Roku licenses a reference design and operating system to TV manufacturers to create co-branded Roku TV models. Under the Roku Powered™ program, Roku licenses its streaming platform to Pay TV providers around the world who want to use the Internet to deliver entertainment services through streaming players. Roku was founded by Anthony Wood, inventor of the DVR. The company is privately held and headquartered in Saratoga, Calif., U.S.
*Current generation Roku players are those introduced after April 2011 and include the Roku 3 (4200X, 4230R), Roku 2 (2720X, 4210R), Roku 1 (2710X), Roku Streaming Stick, both HDMI (3500X) and Roku Ready (3400X, 3420X) versions, Roku LT (2400X, 2450X, 2700X), Roku 2 HD (3000X), Roku 2 XD (3050X), Roku 2 XS (3100X) and the Roku HD (2500X).